With the great success of our last DVD programme filmed at the 2014 event, our cameras were invited back to record the event again this year, 2015. 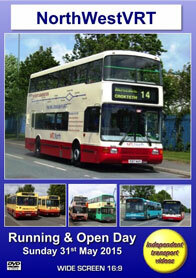 This is the fourth Running & Open day organised by the North West Vehicle Restoration Trust. As before the event is centred on the Trust’s premises on the Kirkby Industrial Estate near Liverpool, Merseyside. As always we start our filming early in the morning as the vehicles are positioned and the visiting vehicles arrive for the day’s action. There are a vast variety of buses and coaches for you to see and enjoy. Companies represented include SELNEC, GMT, CMT, Crosville, Liverpool Corporation, MPTE, St Helens Corporation, Midland Red, Firstbus and many more! Stagecoach supplied a brand new ADL Enviro 400 MMC that had only just entered service from their Liverpool Gillmoss depot, and Arriva sent a brand new ADL Enviro 400 of the previous design. Our filming begins in and around the operating base on Charlywood Road and Lees Road. For your further enjoyment we take a number of rides to sample the different types of vehicles on offer. The first ride is on board Liverpool Corporation L255 (VKB 711) a Leyland PD2 with Crossley H62R bodywork. We ride around the estate and enjoy the sights and sounds from this iconic 1950s double decker. In contrast, our next ride is onboard 0062 (DEM 762Y), an MCW Metrobus which has an Alexander H78F body and is in the colours of Merseyside PTE. Our next is on quite a modern bus that has now joined the preservation ranks in the shape of 5309 (P309 HEM), a Scania L113 with a Wright Axcess-ultralow B40F body. At midday the NWVRT held their “Big Launch”. We were fortunate to go behind the scenes to see the vehicles being prepared for their ‘debut’ to the public. As you will see our cameras went out for rides on some of these buses to show off the hard work put in by all concerned. A further ride is on one of the ‘visiting’ buses, 248 (EDJ 248J) an AEC Swift with a Marshall body from St Helens Corporation. We ride on this to Kirkby railway station and back enjoying the sounds of its AH505 engine. We return to Lees Road and then take eight more rides! These include 3732 (WFX 257S), a Hants & Dorset Leyland National and 0317 (R317 WVR), an MTL North Volvo Olympian, one of the “Big Launch” vehicles. Next are Burnley & Pendle’s Volvo B10M/Alexander 66 (E66 JFV) and Leyland Leopard/East Lancs 34 (MFV 34T), which go on a ‘photo shoot’ for ‘Bus & Coach Preservation’ magazine. We then ride another “Big Launch” bus, 7656 (V656 DVU) a Dennis Dart/Marshall in the MTL Southport (Southport & District) livery. Next is 261 (F261 YTJ) a Leyland Olympian with Northern Counties body in the livery of Merseybus, and then another Leyland Olympian with NCME body, this time Chesterbus, 4 (B204 EFM), smartly turned out in cream and blue, the final livery of the Chester undertaking. Our final ride of the day is on 33 (C49 OCM) the last Leyland National 2 to be built which is in the smart cream and red scheme of Halton Borough Transport. Our cameras film some of the departures at the end of this brilliant day. We would like to thank the NWVRT for organising this excellent event and for inviting our cameras to film it. Duration : 82 minutes (approx).